Problems on sets some times may not be straight forward. We need to apply very strong logic to dig out the underlying the mistery. Study the following problems. First problem is easy. New age consultants have three consultants Gyani, Medha, and Buddhi. The sum of the number of projects handled by Gyani and Buddhi individually is equal to the number of projects in which Medha involved. All three consultants are involved together in 6 projects. Gyani works with Medha in 14 projects. Buddhi has 2 projects with with Medha but without Gyani and 3 projects with Gyani but without Medha. The total number of projects for New age consultants is one less than twice the number of projects in which more than one consultant is involved. 1. What is the number of projects in which Gyani alone is involved? 2. What is the number of projects in which Medha alone is involved? 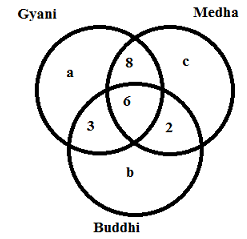 Step 2: Buddhi has 2 projects with Medha but without Gyani. i.e., Medha and Buddhi alone worked in 2 projects. Step 3: Also given, Buddi worked on 3 projects with Gyani but without Medha. i.e., Buddi adn Gyani alone worked on 3 projects. Step 4: Gyani worked with Medha in 14 projects. These two worked together along with Buddhi in 6 projects. So Gyani and Medha alone worked on 14 - 6 = 8 Projects. Lets us assume, Gyani, Buddhi and Medha alone worked on a, b, c projects. It was given that The sum of the number of projects handled by Gyani and Buddhi individually is equal to the number of projects in which Medha involved. Also given The total number of projects for New age consultants is one less than twice the number of projects in which more than one consultant is involved. So from equation (1) we get a + b = 17. Question 1: Gyani alone involved in "a" projects. But we cannot determine uniquely the value of "a"
Help Distress (HD) is an NGO involved in providing assistance to people suffering from natural disasters. Currently, it has 37 volunteers. They are involved in three projects: Tsunami Relief (TR) in Tamil Nadu, FloodRelief (FR) in Maharashtra, and Earthquake Relief (ER) in Gujarat. Each volunteer working with Help Distress has to be involved in at least one relief work project. *A Maximum number of volunteers are involved in the FR project. Among them, the number of volunteers involved in FR project alone is equal to the volunteers having additional involvement in the ER project. *The number of volunteers involved in the ER project alone is double the number of volunteers involved in all the three projects. *17 volunteers are involved in the TR project. *The number of volunteers involved in the TR project alone is one less than the number of volunteers involved in ER Project alone. *Ten volunteers involved in the TR project are also involved in at least one more project. Statement 1: the number of volunteers involved in FR project alone is equal to the volunteers having additional involvement in the ER project. Statement 2: The number of volunteers involved in the ER project alone is double the number of volunteers involved in all the three projects. Statement 3: 17 volunteers are involved in the TR project. Statement 4: The number of volunteers involved in the TR project alone is one less than the number of volunteers involved in ER Project alone. Statement 5: Ten volunteers involved in the TR project are also involved in at least one more project. 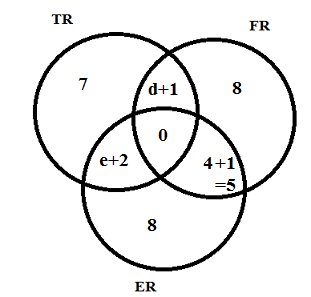 From the above diagram we know that d + e = 6, Also given that maximum number of volunteers are involved in FR. From the above analysis d takes minimum value 4. Which of the following additional information would enable to find the exact number of volunteers involved in various projects? After some time, the volunteers who were involved in all the three projects were asked to withdraw from one project. As a result, one of the volunteers opted out of the TR project, and one opted out of the ER project, while the remaining ones involved in all the three projects opted out of the FR project. After the withdrawal of volunteers, some new volunteers joined the NGO. Each one of them was allotted only one project in a manner such that, the number of volunteers working in one project alone for each of the three projects became identical. At that point, it was also found that the number of volunteers involved in FR and ER projects was the same as the number of volunteers involved in TR and ER projects. Which of the projects now has the highest number of volunteers? Given that volunteers working with only one project is same for all the three projects. 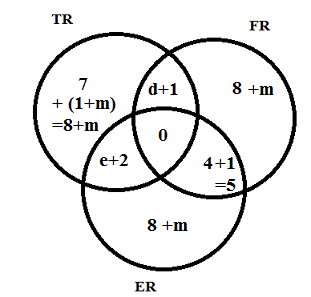 So add m + 1 to TR and m to FR and ER. Also given that volunteers working in ER and TR are equal to ER and FR. So e + 2 = 5 $ \Rightarrow $e = 3. So ER has the highest number of volunteers. It was given that total number of volunteers are 37. But total how many projects they are volunteering? In the above discussion, we have seen that volunteers are with drawing from projects. In that case what happens to the number of projects and volunteers? Volunteers remain same. i.e., 37. But number of projects came down. ( 7 + 8 + 8) x 1 + (d + 1 + e + 2 + 5 ) x 2 = 23 + 28 = 51. There are 4 projects less than earlier. This is because, 4 volunteers withdrawn from working on 3 projects to 2 projects. That is why total projects got reduced by exactly 4. Also number of volunteers in exactly two projects also go up by 4. 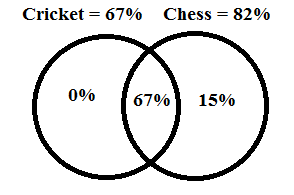 In a class, 67% play cricket, and 82% play chess. Question 1: What is the maximum number of students who can play cricket as well as chess. Question 2: What is the minimum number of students who can play cricket as well as chess, given that each students play atleast one game. So students who does not play any game = 100 - 82 = 18. Ans 2: Total games are 67 + 82 = 149. These 149 games are played by 100 students. As each student play atleast one game, there must be some who play both the games. Give one game to all 100 students. The we have excess of 149 - 100 = 49 games. Now we distribute these 49 to 49 students who have already got one game. So there are minimum 49 students who can play 2 games, and the remaining 100 - 49 = 51 play one game. Observe total games are 49 x 2 + 51 = 149 remains same. There are six institutes IMM-A, IMM-B, IMM-C, IMM-I, IMM-L, and IMM-K in a country named Crazyland. Every year these six institutes conduct a Common Intelligence Test (CIT) and send interview calls to students for the total of 1100 seats distributed among the six IMMs. 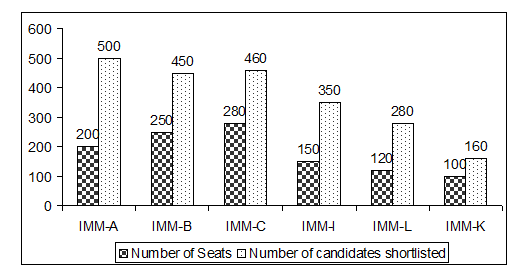 After the interview process is over, each IMM releases the Final List giving the names of the candidates finally offered a seat and Wait List giving the names of the candidates selected in the waiting list in case the candidates in the Final List chose not to accept the offer of the given IMM. A given candidate may get shortlisted in the Final List chose not to accept the offer of the given IMM. Finally it was found that 1500 students received calls from one or more than one IMM. As some students received multiple calls, the sum of total number of calls sent out by individual IMMs exceeded the total number of students receiving calls. 1. What can be the maximum number of candidates whose name appeared either in the Final list or the Wait List of all the six IMMs? So give one call to each of these 1500 students, then we have 2200 - 1500 = 700 calls surplus. We know that a student can get a maximum of 6 calls. So Some of these 1500 students may get a maximum of 5 calls more. So 700 / 5 = 140 students may get another 5 calls. So there are 140 students who can get 6 calls. 2. What is the maximum number of students who received multiple calls? Ans: From the above observation, we know that there are 700 calls surplus to be distributed. We consider getting 2 calls also a multiple call. To maximise the multiple call holders, we give these 700 calls to 700 students. So there are 700 students who got 2 calls, remaining 800 got one call. 3. If it is known that 100 students got selected in either Final or Wait list of exactly 5 IMMs, then what is the maximum number of students who can get selected in exactly 4 IMMs? Ans: If 100 students got 5 calls they have a total of 500 calls with them. So the remaining 1400 students must have got 2200 - 500 = 1700 calls. Giving one call each to these 1400 students, we have 300 calls surplus. To maximize the number of students who got exactly 4 calls, we can give another 3 calls to some of these 1400 students. 300 / 3 = 100.